Silk Road Tour is the highlights of China tours. There are magnificent desert landscapes, the great ruins of significant historical cities and colorful folk custom. The 10 days China silk road tour covers the highlight cities along the way, including Xian, Tianshui, Jiayuguan, Dunhuang, Turpan and Urumqi. See the starting point of Great Wall of Ming Dynasty – Jiayuguan Pass. Experience the “heat” of “fire land” – Turpan. Enjoy the picturesque scenery of Heavenly Lake. Today visit the world famous Terracotta Warriors. The Terracotta Army is a collection of terracotta sculptures depicting the armies of Qin Shi Huang, the first Emperor of China. Then head to visit the Xian Museum and the Small Wild Goose Pagoda. At night, enjoy the Tang Dynasty Music and Dance Show(paid by yourself). Today visit the City Wall. Visitors can rent a bicycle and take a ride on the wall. Then drive to enjoy Huaqing Hot Spring in Mt Lishan. After that, take overnight train to Tianshui. Arrive at Tianshui. Then have breakfast and start today’s tour with Maiji Mountain. Then we will visit Maji Grottoes. Maiji Mountain got its name due to its wheat-rick shape. Maijishan Grottoes is one of the cultural heritages as one part of “the Silk Road”. After the tour, take the overnight train to Jiayuguan. In the morning, drive to visit the Giant Buddha Temple, which is the largest architectural relic in Gansu Province of the Western Xia period. After that, drive about 2.5 hours to visit Jiayuguan Pass. Jiayuguan is a well restored fort marking the edge of the Great Wall in the Ming Dynasty time, in an important place in the Hexi Corridor. Also visit Overhanging Great Wall, the northern extending part of Jiayuguan Pass. After breakfast, drive to Dunhuang. Then head to Crescent Moon Spring, which is an oasis in the Gobi Desert. Enjoy the rare view where an oasis meets the desert and have some fun sand adventure. After that, ride camels across the sand dunes to Minsha Mountain which can make sounds when the wind passes. Morning head to visit Mogao Grottoes that is known as “The Thousand Buddha Cave”, and noted as one of the most important cultural and historical sites in China. After the visit, take the take the overnight train to Turpan. Today we will visit Karez irrigation system, Flaming Mountain and Jiaohe Ancient City. Karez irrigation system is a vertical tunnel system adapted by the Turpan people. Flaming Mountain is red sandstone ridge about 500 meters high, which is the hottest place of China. Jiaohe Ruins is a natural fortress located atop a steep cliff on a leaf-shaped plateau between two deep river valleys. Today drive to visit Heavenly Lake. It is a crescent alpine lake in the north of Bogda Peak, which enjoys crystal water due to melted snow as its source. 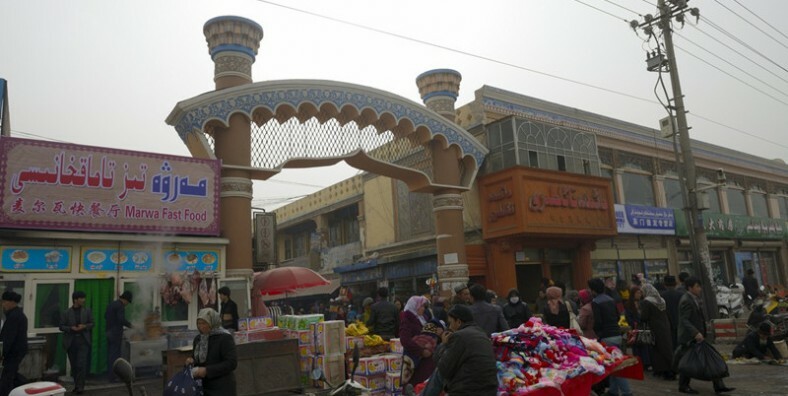 Then transfer to the downtown to visit Xinjiang Museum and Grand Bazaar. Xinjiang Museum is a comprehensive historical museum in China built in 1953, and famous for holding artifacts and mummies of Caucasians who lived in the region 1500 and 4000 years ago. Erqiaodao Grand Bazaar, one of the most famous landmarks in Urumqi city, is the largest bazaar in the world by scale, combining Islamic culture, architecture, ethnic commerce, tourism and entertainment.